This is not really intended as a thorough review, more of a "first impressions" and "that reminds me of" type of post. One of the nice things about being on a reviewer email list is that you get free products, to either critique, promote or both. Often a lot of these free products are single pages of clip-art - which are hard to review because clip-art is something you have to be actually using (in a publication) to have an opinion on. Also when whole RPG games are sent, you have to imagine what play must be like, because immediate playtesting with friends is not always an option. Many products are part of a series, some are for systems with which you are not always familiar. Sometimes the product is written in an unfamiliar language! This are very minor downside. I can see how reviewers can become very jaded, also their sense of what they'd pay might become distorted by all the free downloads codes. I'm finding that my own tastes are usually so select that I'm still spending a customers share on the sites (mainly to buy facsimiles of aolder games I might add) Despite this every once in a while, a freebie is sent out that is actually really exciting to receive (i.e. exciting like "It's Christmas morning!"). You might even already considered buying that product, but maybe not at the current price, perhaps, maybe if their was a sale .... I feel this way about the Mongoose Publishing's 2300AD source book. Even when bundled on the OneBookShelf sites with the Traveller main rules it still feels like just too much to pay for PDFs files. Perhaps PDF prices like these are linked with the printed copy prices, but it all seems pretty arbitrary to me. In saying all this, I am really grateful for seeing the 2300AD source book, as it reminds me of a campaign setting which I used to think was excellent, whilst being visualised through the prism of the today's Traveller rules. Just as a little back-story, let me explain that I was never assured by the new dice mechanics of Mongoose's Traveller, although it was invigorating to see that they very loyal to original Traveller universe ("OTU"). Last year I went on a bit of an Ebay-spree and bought up old adventures and supplements for GDW's first version of Traveller, since I had only owned the Starter Set plus a couple of adventures in my early years of gaming, and by being terrifically under-read when it came to classic sci-fi, some of the conventions and assumptions in Traveller were lost on me. Let's face it, to my young mind "Imperial" equalled "Darth Vader and stormtroopers". More recently, the OTU setting made more sense to me and the vast potential of GDW's Traveller has become clear. In fact, a similar "Imperial sci-fi" styled setting is depicted very well in Grognardia Games's A Thousand Suns (which I adore because it's fairly complete as an all-in-one purchase - It concerned me that Mongoose, after GDW, was continuing down the lines of needing extra supplements like "High Guard" and so forth). 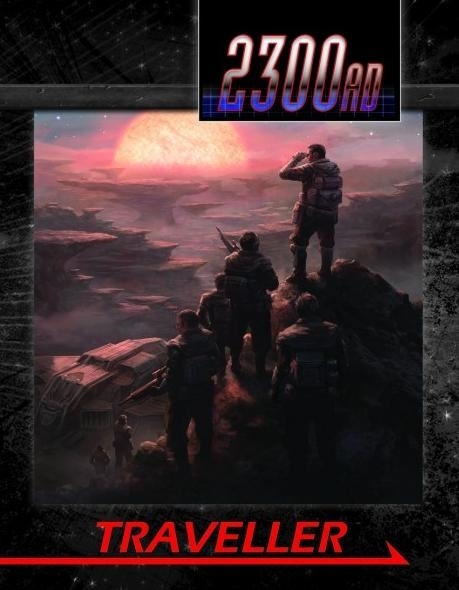 When Traveller:2300 came out in '86, stores and magazines made considerable effort to clarify that it was not linked to the GDW Traveller and that the Twilight:2000 game was part of the history of T2300. Rebranding it simply "2300AD" was an astute move, although replacing "Mankind discovers the stars" with "Mankind's battle for the stars" still divides players on the forums today. 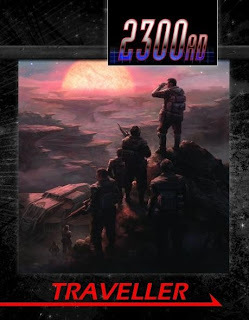 Traveller:2300 was very specific in its setting with nationalities of Earth making slow progress in establishing new colonies, infringing, enclaving and warring with recently met aliens. It was the cover art of T2300 which sold it to me, because at the time it's military hard plastics and battered gun metal screamed "Colonial Marines!" from the Aliens film. This seemed a world apart from the hi-sci-fi of Traveller with it's generic laser rifles, patrons and trading merchants. For Mongoose to fuse original (old-school) far-future Traveller with it's broad Foundation style brush strokes with this, Earth's hands-on tentative steps into space, employing chunky, clunky gadgets and tank armour, seems, at first glance, almost heretical! Hats off to Mongoose for bravery. There are few generalisations flying about the web regarding the older games, so I feel the need here to bust some myths (IMHOpionated and all that). In the first edition, the emphasis was on a selection of aliens (one reviewer claimed that the focus was all on the Kaefers - which the Americans start to fight in what may become a type of Vietnam in space). There isn't much about cyber enhancements in Traveller:2300. T2300 isn't very "urban" either - a Cyberpunk style source book changed that later. At the time I remember feeling that this was a competing product with the re-released Cyberpunk RPG (2.0). The universe of 2300 is described as gritty and sourced from contemporary cinema. Apart from the vehicle, spaceship and weapon hardware, the original editions were incredibly vague with description and there was a real need of very specific scenic environment descriptions, or even just actual "locations". War with the Kaefers? Pentapod enclaves? These were several-line throw-away statements in the original game, and there were very few illustrations to speak of. This was frustrating, because you were forever aware of a hidden canon and naturally you'd seek out the supplements, sometimes only to be disappointed further. My understanding of the Earth space-elevator or anything about the Earth actually came from the Beanstalk adventure set on Beta Canum. The main mission was a bit of a who-dun-it with deadly surprises. Another adventure I owned was "Bayern" which was clearly very influenced by films like 2001, 2010 and books like Solaris, but the campaign leading to the big reveal was an extremely open explore-map-and-catalogue planets mission. Again there was something, if not, a lot, missing in the details. 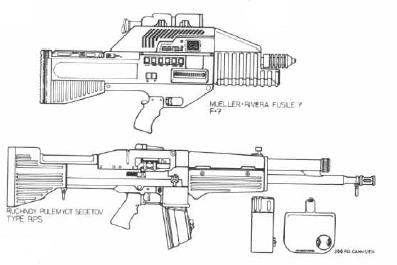 Nonetheless, the pictures of shotguns with LEDs, pulse and gauss guns were welcome, as were the "interface" spaceplanes, blocky hovertanks, even if the rules system was a little stranger than other games. There was a real near-star-list with colony names, but all very broad. Games like this need plenty of smaple building maps, pictures of flora and fauna, cultural commentary and world terrain maps... So it was a "mixed bag" to say the least. One thing that Mongoose 2300AD does do well, is that it provides planet maps. Ace! The colony planets feel like solid, real places. The addition of DNA modifications as a norm seems a little unnecessary. Colonists on one world may commonly have gills. Now, I'd prefer to make it hostile to the point that everyone carries a battered aqua-helmet. I'm not certain what the future 300 years hold, but big gene mods may not be the absolute that the writers feel they are, especially beyond the core worlds where perhaps life is about survival with manufactured technological, but limited, resources. The catch-all here is that DNA-mods are an inevitable result of trading with the bio-tech Pentapods race (although with guns that fire teeth - which is just a little too Cronenburg for my liking - kind of cool though ...). I'm a little fixated on the visuals here but the vehicle pictures in these Mongoose rules are not good. Some of them look very much like computerised net models - which will date a lot faster than the 1980s technical drawings of Dietrich and others in GDW T2300/2300AD. more pictures of guns- like these! Where are the gun pictures? Surely the look and feel of the equipment is really important to distinguish this source book from the main Traveller setting? The descriptions are there, but show us some eye candy! And what's all this rubbish in the promotional blerbs about "no anti-gravity" and use of "helicopters"? Surely there's a better genre description for this type of science-fiction which isn't reductive? Okay, it's not "near-future" and it's not "far future", but come on! However... as a sourcebook for today's gamer, the potential for the 2300AD setting is HUGE, the supposedly gritty feel on the broad backdrop of newly settled worlds will make for a great campaign - and many styles of game are possible from espionage to battlefield war. I do suspect that if this product is successful that a 2nd edition will have to come out because it really needs a lot more illustrations to emulate the grit-and-bulk atmosphere implied in the text. Illustraions aside, the whopping 312 pages are packed with background information and game material. In summary, 2300AD it's a bumper book with plenty of details about many of the colonies and enclaves in the 2300AD near-star sphere. How it fits with Mongoose's Traveller will be up to individual players to interpret. The good news is that if Mongoose Publishing don't produce more 2300AD products that there's the so many older T2300/2300AD products out which can be "mined". What players may discover however, is that the Mongoose edition has already gleaned the best of the basics, presented them in a complete and succinct form which can't be found in the original product range. Currently the PDF bundle of the Traveller Core Rules and 2300AD is great value when compared just the 2300AD on it's own (DriveThruRPG links). At the normal prices, I'd probably I'd probably invest in buying the hard-copy rulebooks. it's a shame that their isn't a deal to combine the books with the PDFs, since it's not uncommon for players to pick up rules in PDF form that they already own - if only for quick-searching at the gaming table. As a general note: 2300AD is implicit in its need of the Traveller Core Rulebook. The introduction also suggests that Supplement 5: Vehicles and 6: High Guard "would also be useful".